Turkey on Sunday condemned Saturday's terrorist attack in Pakistan which killed several soldiers. "We strongly condemn this heinous terrorist attack. 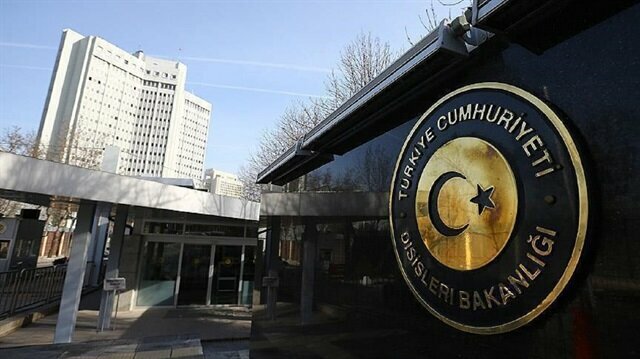 We wish Allah’s mercy upon those who lost their lives, speedy recovery to the wounded, and convey our condolences to the brotherly Government and people of Pakistan," Turkish Foreign Ministry said in a written statement. At least 11 Pakistani security personnel, including an army officer, were killed and 13 others were injured on Saturday when a suicide bomber blew himself up near a military camp in Swat district of northwestern Pakistan. Following a recent spate of deadly terrorist attacks in Afghanistan, Islamabad and Kabul on Saturday expressed their commitment to continue their discussions to reach an agreement for peace and solidarity.A high-level Pakistani delegation, led by Foreign Secretary Tehmina Janjua and comprising of senior civilian and military officials, met an Afghan delegation, led by Deputy Foreign Minister Hekmat Khalil Karzai, in Kabul on Saturday.The two sides discussed the Afghanistan-Pakistan Action Plan for Peace and Solidarity (APAPPS) -- a joint action plan for cooperation in the areas of counterterrorism and reduction of violence, peace and reconciliation, refugees repatriation and joint economic development.“There are still important areas to be discussed and agreed upon, and both sides remain committed to continue their discussions to reach an agreement on the APAPPS,” said a joint statement released after the meeting.On Wednesday, top Afghan security officials rushed to Islamabad with “undeniable proof” of Pakistan-based terrorists’ involvement in recent assaults in Kabul that claimed close to 200 lives last month.Afghan President Ashraf Ghani on Saturday also held a meeting with the High Peace Council (HPC), a top government body tasked with reaching a peace deal with the Taliban.He reiterated the toughened stance adopted against the militants in the wake of brazen attacks in Kabul, and said doors for peace were no longer open for all militants and those bent upon terrorism would be hunt down.“We would take revenge wisely and with a plan”, he said.Suicide explosion kills 11 soldiers in NW PakistanPakistan, for its part, vowed to do “whatever it can” for peace and stability in war-torn Afghanistan, which is fighting back a revitalized Taliban insurgency.Talking to reporters along with Afghan Ambassador Hazrat Omer Zakhilwal on Thursday, Pakistani Foreign Minister Khawaja Asif called for a close cooperation between the two sides to fight the common threat of terrorism, local broadcaster Express News reported. “Both Afghanistan and Pakistan are victims of terrorism, therefore there is a need for close cooperation between the two countries to fight this common threat,” said Asif. The foreign minister added that the Afghan delegation, which visited Islamabad on Wednesday, had productive talks with Pakistan. The Afghan government blames the powerful Haqqani network for recent attacks and had accused Pakistan of providing sanctuaries to the militant network on its soil. However, Islamabad has denied the charge and accused Kabul of allowing anti-Pakistan Taliban factions to launch terrorist attacks on civilians and security forces inside Pakistan from its territory.